As mentioned in a previous post, I'm planning to make lip colors soon! I make perfumes and lip balms, and it has always been a sort of dream of mine to do lipsticks, so I thought now seemed a good time to start. However, these won't be lipsticks, but old-fashioned "lip rouge" in a pot, the type you apply with a brush. After all, if you would like to know a little secret, the names I gave to my perfumes, "Eliza Fragrances" was one I came up with easily because I once wanted to start a company called "Eliza Cosmetics." Why 'Eliza'? It's the first half of my middle name, 'Elizabeth.' But the name 'Eliza' is classy and alluring, a bit like the name 'Ava' or 'Rita'. At least, I think so. Anyway, my dream of my 'future' cosmetic company was that I would have lipsticks, nail colors, and nail files, which I was fashioning myself with some kind of filing stone. That was before my vintage days, before I discovered my true style, and the dream died out--all except for the lipstick part. So, why am I choosing potted lip rouge instead of lipsticks? A few reasons; one, lipstick molds are VERY expensive. I don't really want to think of all the work involved of pouring into molds and assembling the lipstick in the tubes. Besides that, it's necessary to find a base with just the right balance of creamy and soft, yet still firm enough to hold its shape in tube form. Another reason, so you won't only suspect me of laziness (ha, ha), is that potted lip rouge is quite a novelty. Unmistakeably vintage. And that's what my perfumes are all about; bringing back classy vintage scents that one can't get a hold of anymore. Now I might be able to do this with lip colors--if all goes smoothly! While I'm really excited, I'm also pretty nervous. I have a lot of shades planned, but will it work out? I'm afraid the color will come out sheer, or that the base will be too oily. Or I won't get the color just right. I ordered some samples from the mineral makeup supply company TKB Trading last week. There are a few suppliers out there, but I really liked TKB Trading's extensive information on the pigments (i.e. specific FDA approvals), and the site seemed very user friendly and organized, with articles, recipes, user reviews, lots of how-to. I emailed them and the response I received was prompt. I'm hoping these are all good omens! thank you for stopping by my blog. your project for the coming year sounds very interesting and enterprising. I hope you succeed. 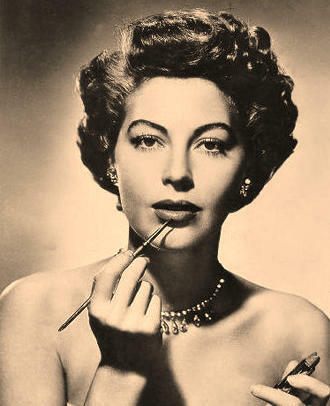 - perhaps I will be able to help you promote your vintage-styled lip colours!